Gerry James, aka Kid Dynamite , was not only the youngest player ever to play in the CFL at 17, but he was one of the toughest athletes of his time. While playing with the Winnipeg Blue Bombers in 1954, James was the very first recipient of the CFL’s Schenley Most Outstanding Canadian Award. He won the award a second time in 1957. James led the league in scoring in 1957 and held the record for most rushing touchdowns in one season for forty-three years. He was on four Grey Cup winning teams. Along with his father, he holds the honour of being a member of the CFL Hall of Fame and the Manitoba Hall of Fame. 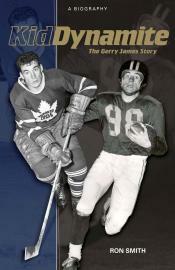 Not only did James achieve greatness in football, but after winning a Memorial Cup with the Toronto Marlboros in 1955, he went on to play hockey for the Toronto Maple Leafs for four seasons. James is the only person to play in a Grey Cup and a Stanley Cup final in the same season. In the 1970s, after coaching in Davos, Switzerland, he embarked on a twenty year career as one of the most successful coaches in Canadian junior hockey history. All in all, this story of Canada's Bo Jackson is a fascinating tale. Ron Smith does a good job of telling it. If you're looking to learn more about one of Canada's forgotten sporting heroes, Kid Dynamite is for you.